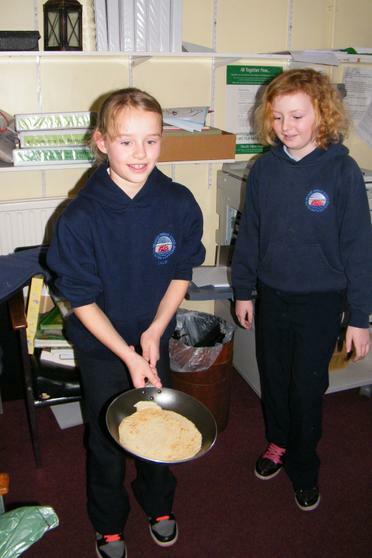 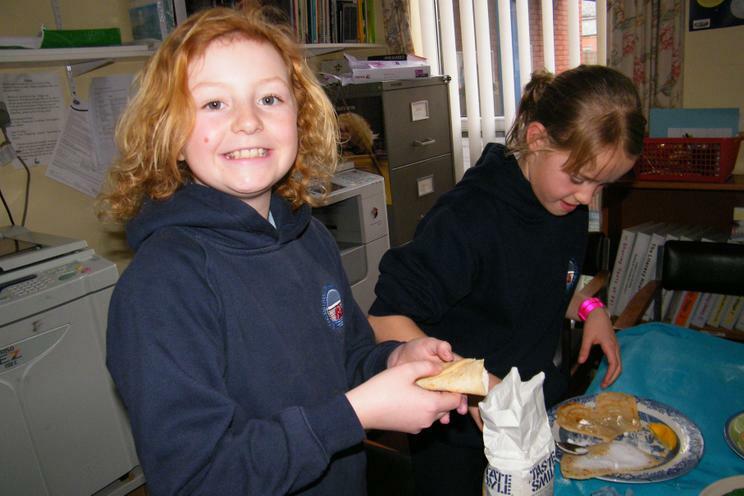 Making Pancakes is a common event in any school it of course has lots of traditions associated with it over Lent, and of course they are cheap, fun and easy to make. 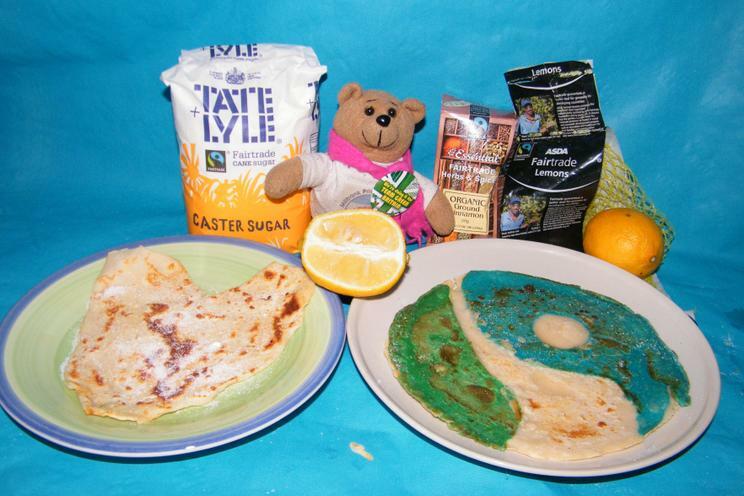 Using FairTrade ingredients is hardly any more expensive and it shows how easy it is to make little changes to include FairTrade in your shop. 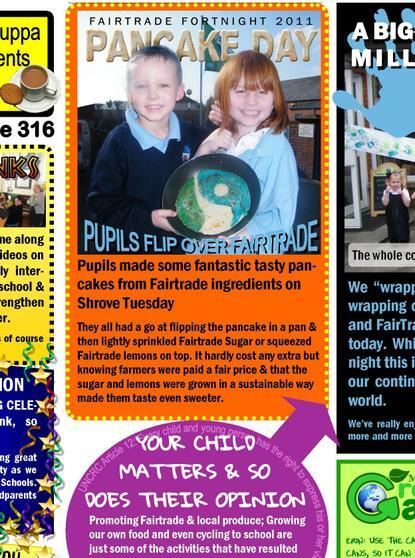 In fact many people all over the country probably used FairTrade sugar without even realising it. 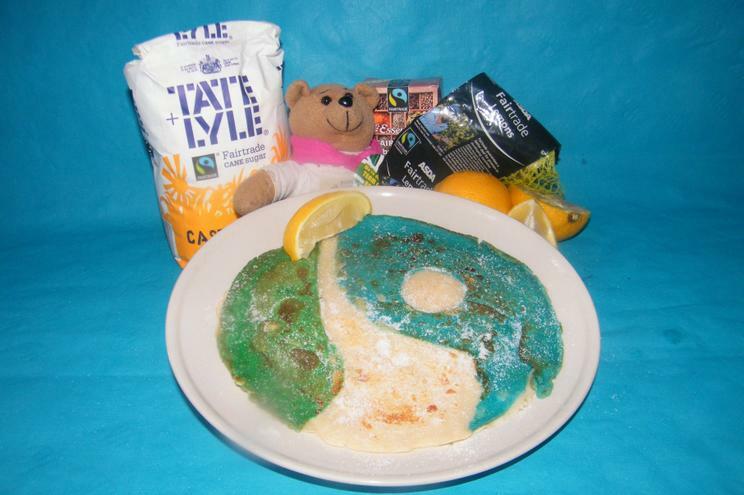 Tate & Lyle Sugar started converting its production to become FairTrade in 2008. 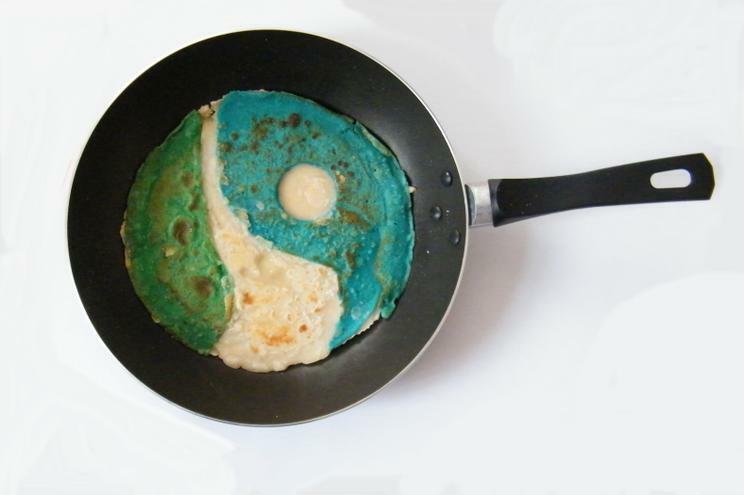 At the time it was one of the biggest ever switches to FairTrade. 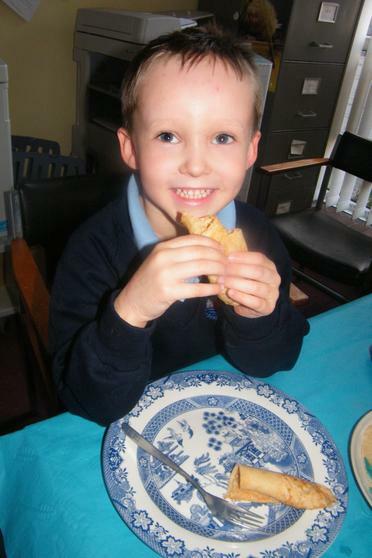 The Fairtrade Cinnamon spice at 90p (from the FairTrade Shop in Canton -Siop Teg) is pretty hard to beat on price. 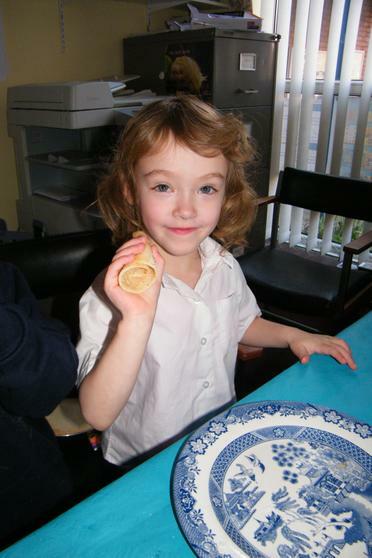 The Asda FairTrade lemons are a better quality than the cheapest budget ones you can buy so there was no waste as each was really juicy. 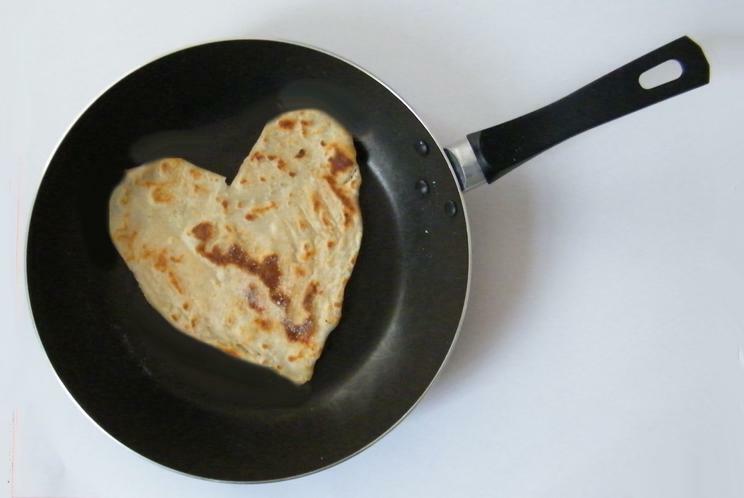 Pancake Day falls on a different date every year, because it always precedes 'Ash Wednesday', the first day of Lent. 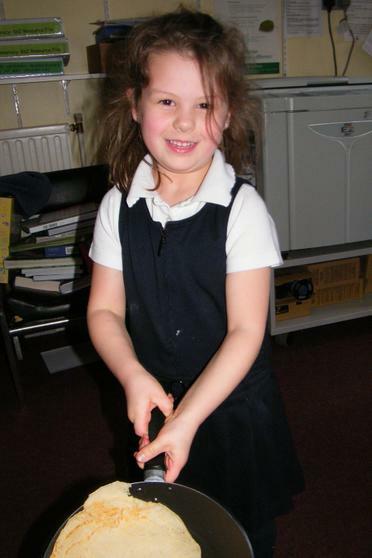 Traditionally Christians went to make their confessions and were 'shriven' or absolved from their sins on the day before, and this then become known as 'Shrove Tuesday'. 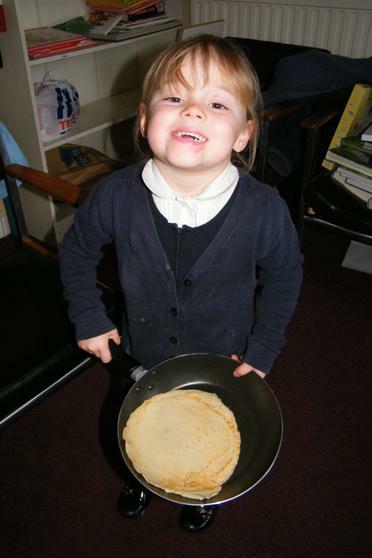 With Lent beginning the next day, and a 40-day fast, during which people used to give up 'luxury foods' which then were eggs, milk and cream. 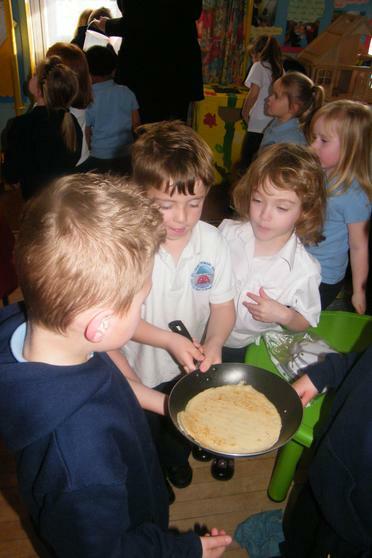 What better way of using these precious ingredients, than in a batch of sizzling, fresh pancakes. 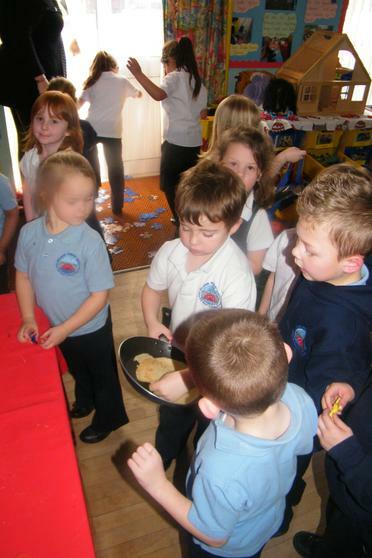 Whilst we are having fun we looked at the ingredients that go into making the batter and even talked about how the same basic batter to make pancakes is used to coat fish before frying, or used to make Yorkshire puddings. 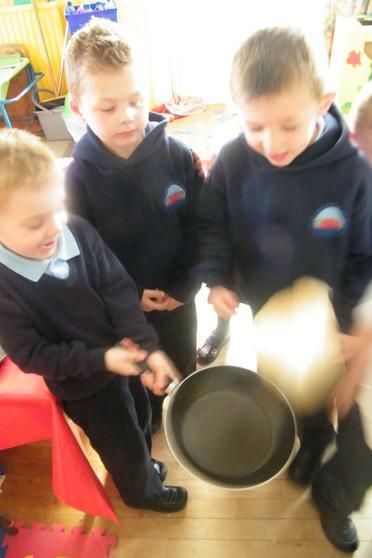 We even talked about how it changes from liquid to solid. 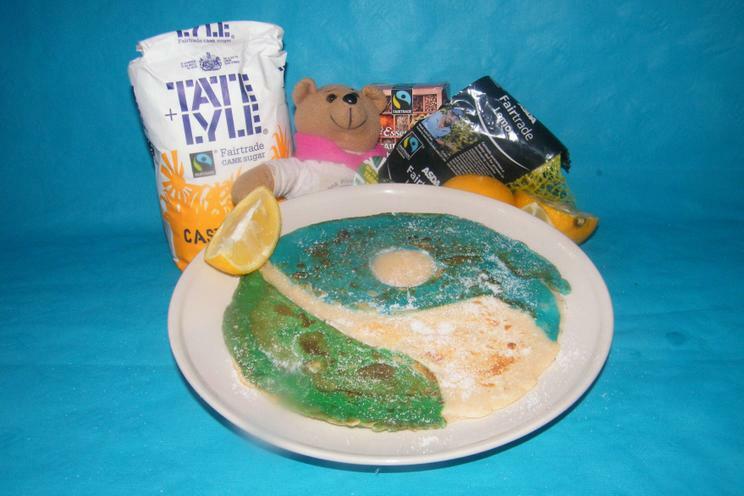 We used spray oil because it is safer and healthier, you can make special '1 sin slimming world pancakes' if you/ or your mum is on a diet. 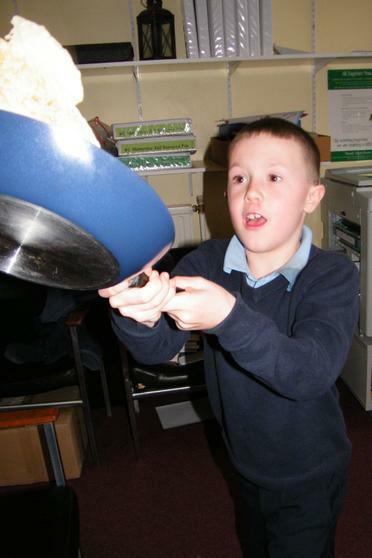 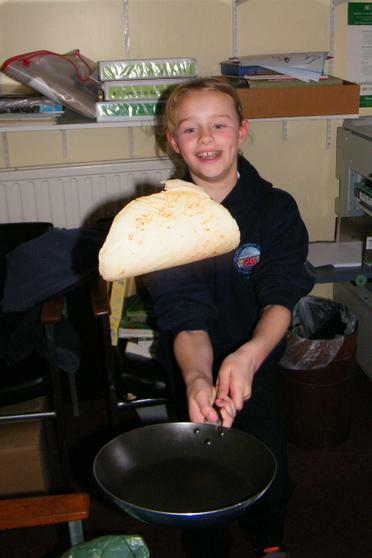 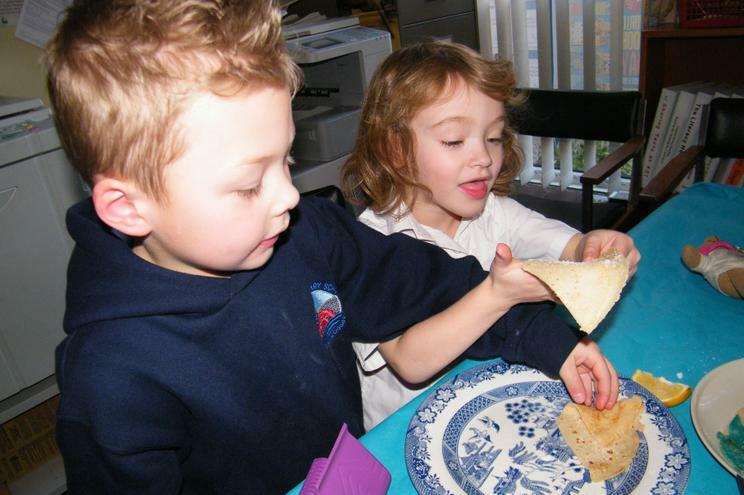 We all had a go at flipping the pancake in the air to see if they could turn it over- it is supposed to bring good luck. 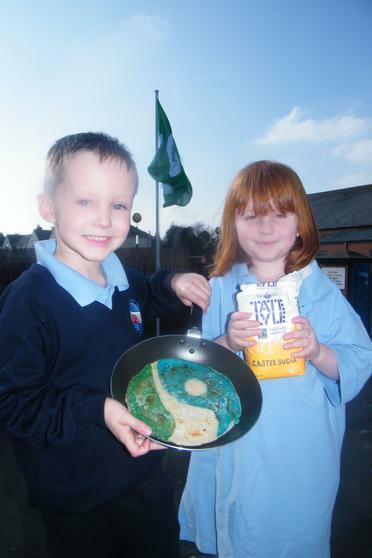 ( In fairness it would be bad luck if it lands on your head or the carpet and you wanted to eat it. 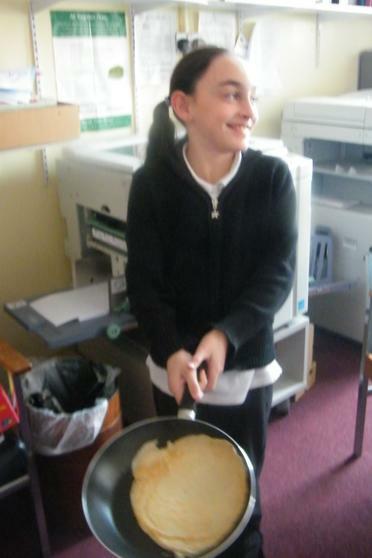 As it was we had a stunt pancake to practice with first!) 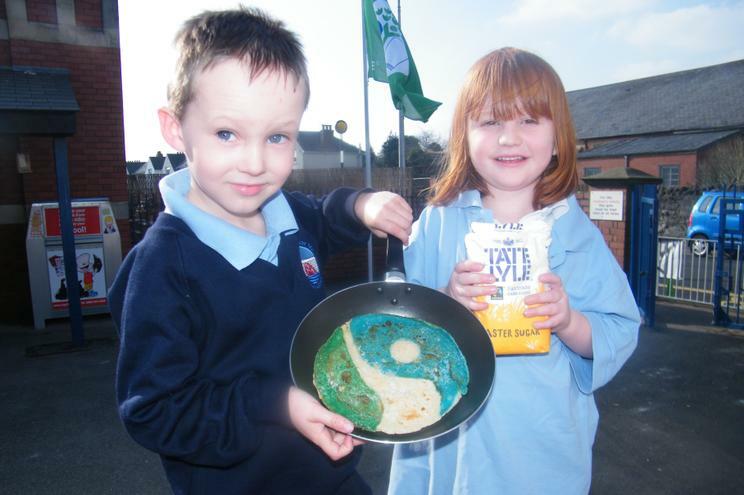 The children who made one got to eat one, some had a sprinkling of FairTrade sugar, some had FairTrade lemons or FairTrade cinnamon added. 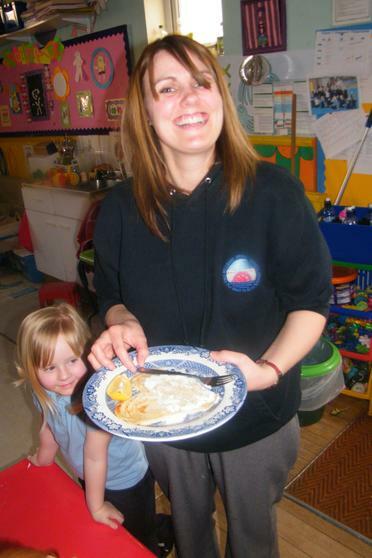 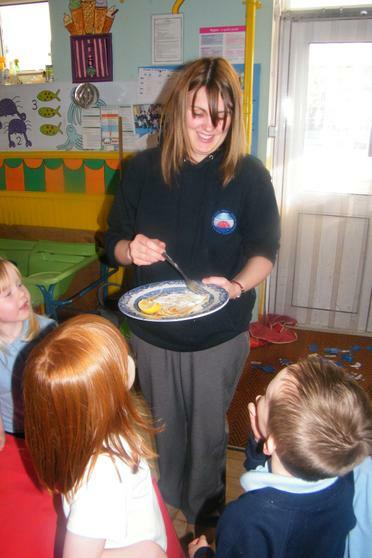 We even made a special heart shaped pancake for our lovely teacher Miss Clissold. 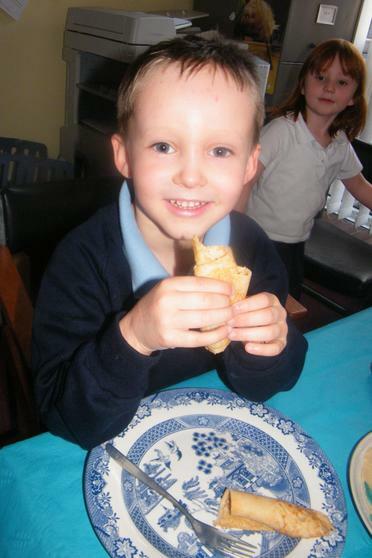 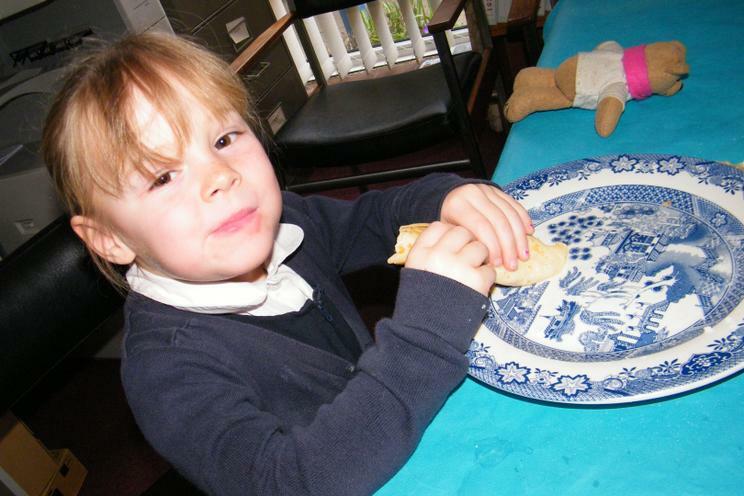 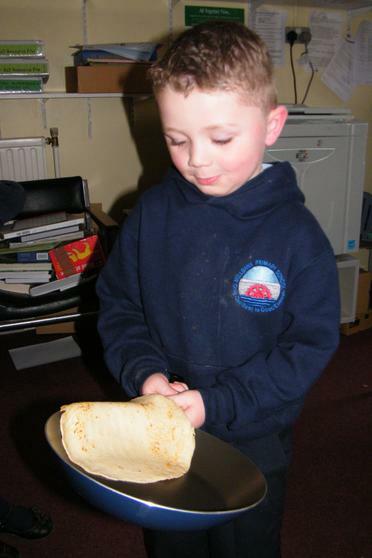 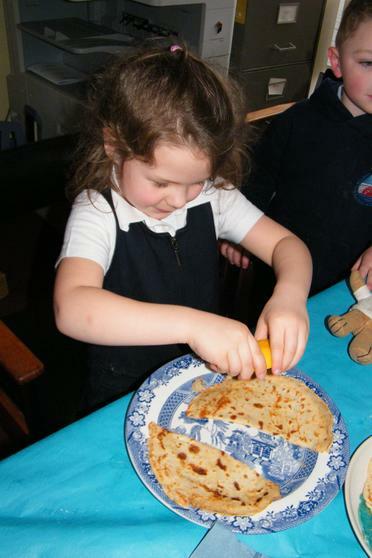 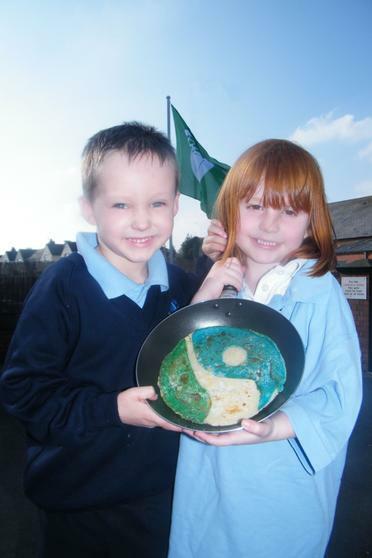 The infants had been busy with their 'Around the World' project and when they looked at the pancake it reminded them of the Chipati from Indian, The tortilla from Mexico and the smaller duck and crispy pancakes from China. 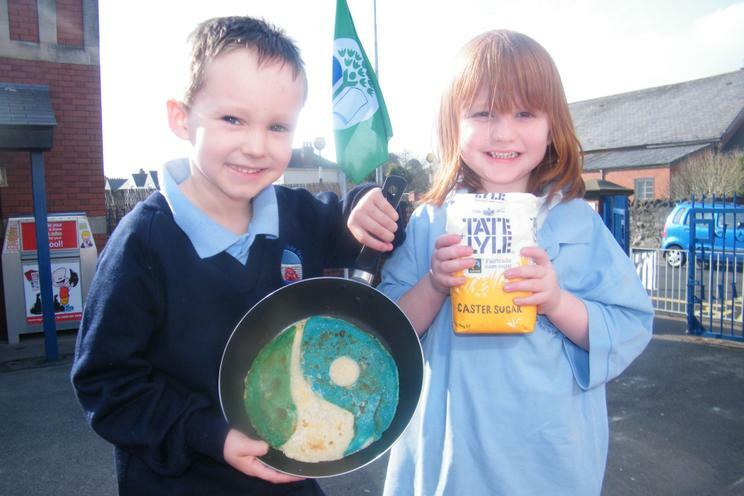 What a clever lot they are! 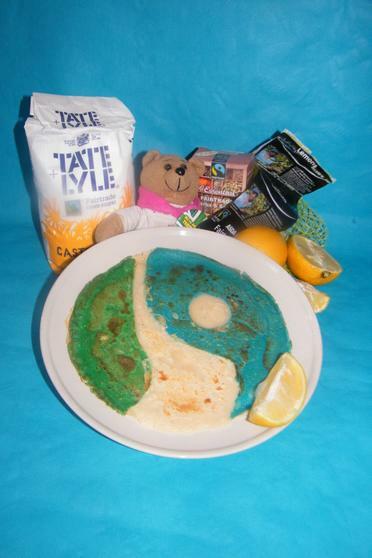 All the pancakes we made tasted lovely, but knowing that the ingredients are FairTrade certainly makes them taste just that little sweeter! 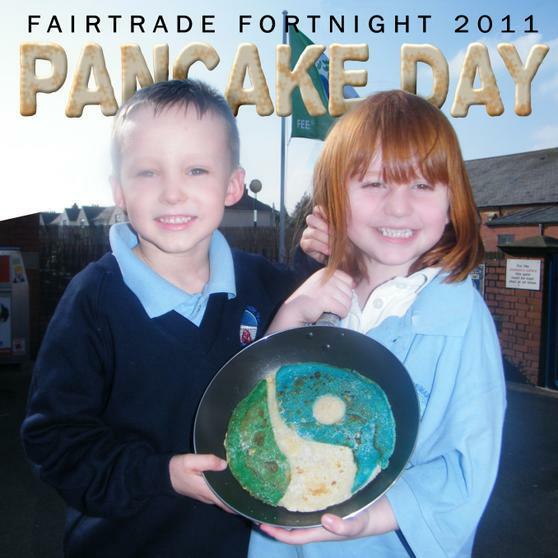 Go on keep an eye out for the FairTrade logo on your next weekly shop and do something to make the world a Fairer place.